Back-Up Story: "The Origin of Zatanna"
The new Suicide Squad ambush the Black Marvel Family after Black Adam and Isis meet up with Osiris and Sobek. In the heat of battle Osiris kills the Persuader when the villain attacked his sister. Osiris is overcome with grief and begs for forgiveness. Black Adam suggests that they go home before anyone else gets hurt. Count Vertigo checks in with Amanda Waller who is rather pleased with the outcome of the battle, especially since the video feed was live and recorded. With Oracle's help Steel gets in contact with his niece. At first she is annoyed as Steel points out that his "skin condition" had gone away. Natasha believes that John Henry had cured himself but John informs her that it went away on its own. He goes on to ask how her teammate Trajectory could have been killed by Blockbuster if she could move so fast. As he leaves he reminds her that she is a scientist and that she should draw her own conclusions. Lex Luthor has Clark Kent kidnapped and drugged to find out if Supernova is actually Superman in disguise. Clark laughs at the question and tells them that while he has no idea who's under that mask it certainly isn't Superman. In Gotham City Vic Sage is rushed to the hospital. In Metropolis the sky fills with heroes from Luthor's Everyman Project as the Big Red S prepares to drop to celebrate the New Year. As the clock strikes midnight and a New Year begins Vic Sage quietly passes on with Renee Montoya by his bedside. Back in Metropolis Lex Luthor removes a remote control from his jacket and presses the button. Zatanna's father was the world famous stage magician Zatara who was also used his very real magical powers to fight crime. One day Zatara was kidnapped by an old foe and when Zatanna began to investigate his disappearance she discovered that she comes from a long line of homo magi, men and women who had inherent supernatural powers. She taught herself to tap into her own latent abilities and used them along with assistance from the Justice League, to find her father. Afterwards she joined the League and despite making some questionable ethical decisions she was able to rebuild her reputation as one of the world's leading sentinels against mystical threats. Main Story - 5: After a rather Merry Christmas Johns, Morrison, Rucka and Waid decided to get all heavy on us. This had to be one of the most heart wrenching chapters yet and the more I felt something for the characters the more I realized how successful the writers were in sucking me into the story. The ambush on Black Adam and his clan was rather upsetting in more ways than just Osiris killing Persuader in the heat of battle. It was the set-up that got me, though if you are going to get set-up in the DC Universe Amanda Waller is the one to do it. The question is did she know that Osiris could be pushed like this or was the Persuader's death just the icing on a cake? From Waller's dialogue I get the sense that she was pushing for this but it could be read both ways. It was an emotional battle. The exchange between Adam and Atom Smasher brought back all of the baggage from their previous time together, or at least it did with me. Atom Smasher's dialogue could easily have been about his own actions as it was about Black Adam. Waller knew this, which is why she put Albert on the team. Black Adam doesn't have that guilt. His convictions tell him that he is already atoning for his sins; turning himself in to a government he considers corrupt and hypocritical goes against those convictions. It was Osiris that got to me the most. This is a kid that wants nothing more than to be a hero and do the right thing. Making it into the Teen Titans was such a big deal to him and the writers did such a good job of making that excitement believable, even infectious, which made his killing of the Persuader all the more upsetting. Amanda Waller compared to him to Superboy Prime (or that's the way I saw it) but there is nothing to that comparison. Superboy Prime went on a rampage because he was emotionally unbalanced. Osiris took out a man that was about to kill his sister. Unfortunately the world probably won't see the difference, which makes it all the more tragic. What made this installment so good (and deserving of the rating I gave it) is that the rest of the issue stacked up to that first scene. The bit with Steel and Natasha was very satisfying, especially since Steel went from a position of having to beg to get his niece's attention to shoving the information in her face and letting her make the decision. I also dug the fact that Oracle and the rest of the Birds of Prey played a part in it as well. Then there was the bit with Clark Kent getting drugged and interrogated. The smile on his face when he informed Luthor that Superman definitely wasn't masquerading as Supernova was fantastic. More than anything it was the death of Vic Sage that got to me. I will admit that I was a bit put off that the writers had decided to kill off the character, especially since they had done such a good job of bringing him back. Despite this I thought that they had treated his illness such dignity and his death was no different. Sure it was a bit calculated to have him die just as the New Year was born, but with the way they paced the scene, especially putting it up against the image of the heroes from the Everyman Project filling the sky in celebration it really didn't matter. The image of Renee by her friend's side, the singing of "Danny Boy", all of it came together to make a truly moving sequence, which was made somewhat sinister by whatever Luthor has in store. Johns, Waid, Rucka and Morrison figured out a way to end on a cliffhanger. That is fantastic. Art - 4: There were two moments in this issue that made me sit back and marvel at the artwork. The first came early after Osiris inadvertently killed the Persuader. The sequence of panels where it dawns on Osiris exactly what he had done followed by him and his sister holding each other in the rain was amazing. The fight that came before was fantastic as well, but the aftermath was heart wrenching. The second came at the very end. The combination of the people from the Everyman Project flying around in celebration and the Question quietly dying while singing "Danny Boy" was a lot to take in at first. The two emotions played beautifully against each other as Bennett and Jose captured the thrill and hope that comes with a New Year as well as the sadness and grief that comes when someone you care about dies. It is hard to describe how the scene made me feel, but I was genuinely touched by it. Backup Story - 3: This was the first origin that I thought didn't enjoy all that much. Then again Zatanna is such a messed up character historically and has had so many interpretations that boiling her down to two pages must have been maddening. Waid hit all of the right beats though and gave us just enough information to familiarize us with her background. I just didn't like as much as Waid's past efforts with these origins. Art - 4: Brian Bolland was a great choice for this origin sequence. While I wasn't so hot on the Dr. Light panel I couldn't find any fault in the rest of the two pages. My only real disappointment was not seeing some of Zatanna's other uniforms, but I guess I can't win them all. Cover Art - 5: Well, that cover certainly makes an impact in regards to the fate of Vic Sage, doesn't it? In all seriousness I thought that this was one of the more compelling covers of the series and it is amazing to see the level of detail that was put into the feet. Yeah that sounds weird, but I can't describe it any other way. 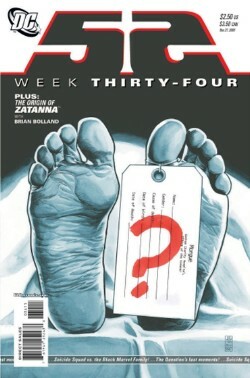 The fact that the cover is mainly black and white except for the red question mark on the toe tag makes it even more eye catching. This was a great cover, certainly one of the best from the series.